主页 股市 股市 | 卖了最贵的AGM入门票,什么?卖了Nestle鸟巢?! 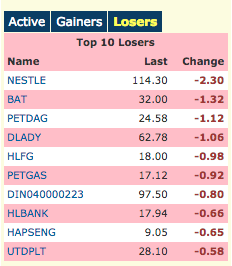 That means Nestles is selling at P/E ratio of 42 (Rm 113 divided by Rm 2.69 = 42). I see so many jubilant investors in i3investor rejoicing and congratulating one another. They are boasting that they did not sell their holdings.They do not seem to know what is P/E ratio. If they knew the true meaning, they would have sold their holdings. It means the current share price is divided by its earning per share for the financial year. P/E 42 means that if the company pays out all its earning to the shareholders every year, it will take each shareholder 42 years to recover the cost for buying the share at Rm 113 per share.